Starting school or returning after the long summer break can be overwhelming for some children causing worries, nerves or even anxiety. 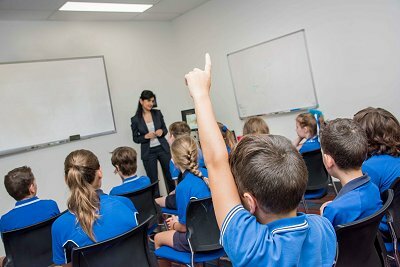 "Anxious children and teens worry about many different school-related issues such as teachers, friends, fitting in and being away from their parents," Sydney Local Health District Occupational Therapist Stacey Argent said. Before the first day of school, your child may cling to you, cry, have temper tantrums (get really upset), complain of headaches or stomach pains, withdraw and become moody or irritable. "It is developmentally normal for school aged children to experience fears and worries," Stacey said. "It's really important for parents to coach their children through gradually facing their fears and worries." Research shows if children avoid things they are scared of they will become more anxious and generally avoid new and uncertain situations. If your child is able to learn to face their fears in a slow, consistent and structured way then they can learn the skills to cope with and manage their anxiety. When the anxiety is linked to separation from mum or dad it can help to give your child a small object that reminds them of you to take to school. Stacey also suggests that parents prepare their child for what they are about to do. Don't suddenly leave or take a long time to say goodbye. Make goodbyes short but clear. Importantly, try to stay calm yourself. "You know your child best. If you're worried about anxiety, consider seeking professional help," Stacey said.